Japanese lilac with room to grow. Understanding the site conditions is key to finding the best plants that match both the growing conditions and your vision for your landscape. Searches will yield the best results if you start with the most critical criteria: zone, soil, light, plant type and size. A landscape will not be sustainable if plants are stressed by trying to grow in the wrong zone, soil type and cramped spacing. In some cases, landscape use also falls into this critical list as you may be selecting for a very specific purpose / design such as xeriscaping, attracting wildlife or erosion control. After entering this critical criteria, clicking search and reviewing the results, add more subjective features such as texture, form, and seasonal interest. Click search again, add another criteria, and so forth. Eventually, you will have some solid options that fit most / all your needs. Regardless of whether you plant 4" transplants, two-gallon containers, or B&B trees, plants should always be spaced so that they can grow to their mature size without touching or barely touching neighboring plants or structures. In this picture (right), a pair of columnar junipers are planted on top of the roots of a Gingko. Aside from the fact this is poor design and the form of the juniper is compromised, this close proximity will force competition between the plants for water, nutrients, space and - ultimately - light. Spacing plants in this manner puts the junipers and the gingko at a disadvantage and creates a stressful growing situation. If, after planting, a landscape of young shrubs and trees looks sparse, fill in with annual flowers, or perennials that can be moved / divided as the woody plants mature. 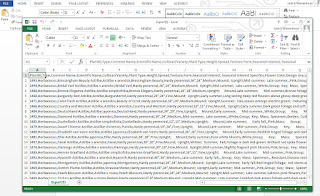 A .csv file exported from the Plant Elements of Design. Commas separate the plant data information. 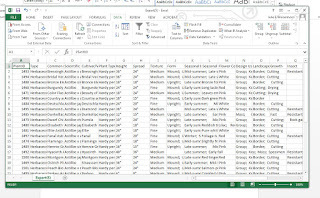 Plant Elements of Design exports plant lists as comma delimited files (.csv). This file format accommodates various spreadsheet programs. This is important as we have users literally from all over the world on different platforms. Using the .csv file format provides flexibility. 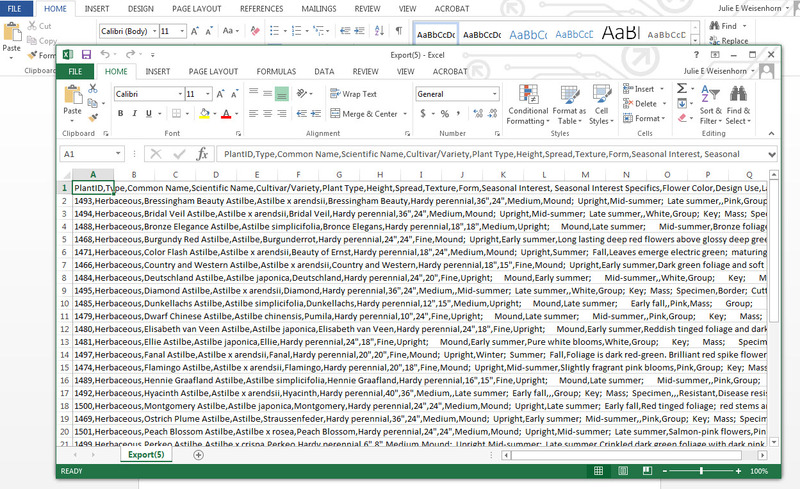 The file after "Text-to-Columns" was applied. Highlight the first column on your .csv file. Click on DATA on the toolbar. Click on "Text to Columns”. Click on “Delimited” and “Next”. Click on “Comma” and “Next”. Be sure to save your converted file! determined to be invasive in Minnesota. Been looking for your favorite Japanese barberry 'Rose Glow' on Plant Elements of Design and can't find it? These and other plants that are invasive are not in the database. We want to promote good plant choices that will not become invasive in our landscapes. By 2017, this barberry and 24 other Berberis thunbergii cultivars will be classified as invasive by the Minnesota Department of Agriculture and Minnesota Department of Natural resources and they will no longer be available for sale. To help you find replacements for these invasive cultivars, a new category will soon be added to the Search options called Alternative for:. This category will identify a plant as an good alternative choice to replace invasive plants such as Norway maple, Japanese barberry, exotic honeysuckle, etc. The resources tapped for this information come from the MN DNR, the MDA and MIPN (Midwest Invasive Plant Network). Welcome to the Plant Selection blog, an online community where people can learn and share ideas about good plants for gardens. Good plant selection is straight-forward: match a plant's growing needs to the site conditions. Plants growing in optimal conditions will live longer, resist pests, and look better. They don't simply survive - they THRIVE! 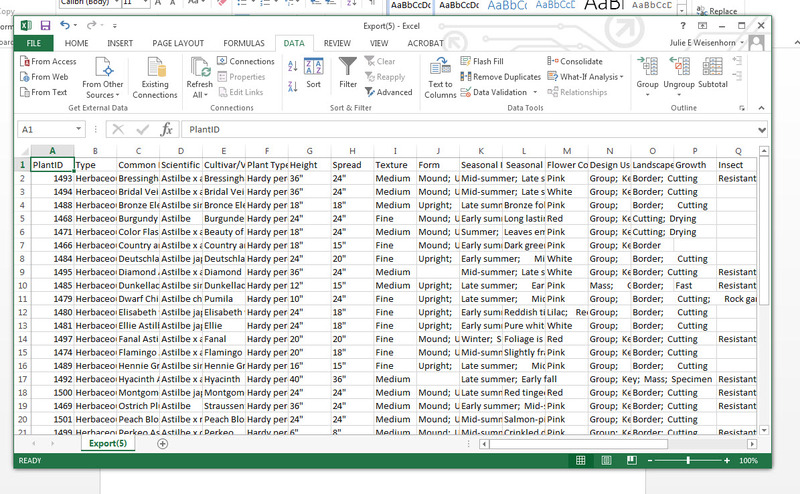 Once selected, you can save plants to a spreadsheet to create a plant key for your design. Or a budget for your landscape. Or a wish list for next year. Want to see ALL the plants in the database? Click "Export all plants." Like looking at plant pictures? Click "View images" and enjoy looking through the 3400+ downloadable plant images (with more being added all the time). I admit it, I'm a plant geek, and I'm looking forward to hearing from others with a passion for plants, good design and gardens. Tell me about your experience with the Plant Elements of Design. Feel free to use this blog to ask questions. Post pictures of your plant selection successes and experiments (there are no failures!) and remember to add ideas for new database features and plant additions for future updates. Copyright 2015 Regents of the University of Minnesota. All rights reserved.